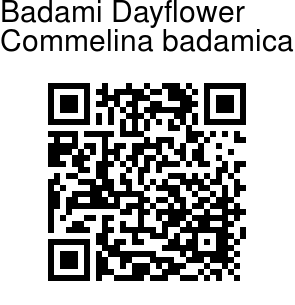 Badami Dayflower is an annual herb, diffusely branched, about 30 cm tall, ascending to erect, with or without definite growth. It is named for Badami, a tourist destination in Karnataka. Flowers are 1-1.2 cm across, dark blue in color, rarely white, flower-stalk about 5 mm, hairless. Lateral sepals are paired, elliptic, about 4 mm long, 2 mm wide, petaloid or faint blue to white, concave at tip; medial sepal slightly to broadly elliptic, about 4 mm long, 3 mm wide. Lateral petals are paired, clawless or rarely with inprominent claw, limb round to sub-round, about 6 mm long, 6 mm wide, dark blue, medial petal nearly-round, about 5 mm long, 4 mm wide, dark blue, rarely white. Badami Dayflower is similar to Willow Leaved Dayflower, but differs in having an indefinite habit, linear to narrowly lanceshaped leaves, finely velvet-hairy, velutinous to woolly spathes, upper cincinnus with single male flower, clawless petals, yellow to golden yellow antherodes, velutinous ovary, radiately tri-lobed stigma, single capsule per spathe, spathe with rounded or retuse tip, oblique base, and prominent mid-ventral constriction, and trapezoidal, ventrally flat seeds. 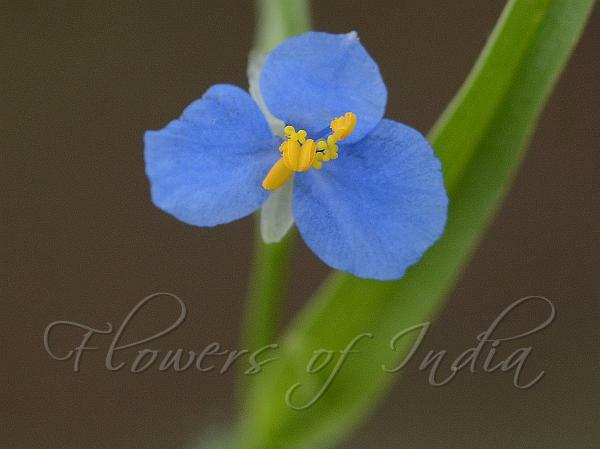 Badami Dayflower is found on sandstone plateaus of the Bagalkot and Gadag districts of Karnataka and is possibly endemic to this region. Flowering: October-December. Identification credit: Mayur Nadikar, Jagdish Dalvi Photographed in Mahukuteshwer, Badami, Karnataka.